Do you have more household goods than can fit in your current home? Or are you a military member deploying who needs somewhere fast and safe to store your belongings? Perhaps you’re a confirmed DIY-er and prefer to move yourself. What options are available for your DITY (‘do it yourself’) or Personally Procured Move? 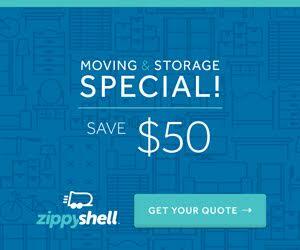 Zippy Shell offers storage and moving solutions to fit your needs, no matter what stage of life you’re in. What are some of the differences that make Zippy Shell unique? Storage solutions: Zippy Shell brings a storage container right to your curb, gives you plenty of time to fill it, and then moves it to their secure, climate-controlled facility. No need for you to drive back and forth to a storage facility. And they’ll bring your things back when you’re ready! Only need a few items back? Simply give them a call and they’ll deliver it right to you. What could be more convenient? For DITY moves: Zippy Shell will provide service for your Personally Procured Move with less labor involved than renting a traditional moving truck. Need help loading and unloading? No problem. They will also drive, drop off, and pick up your household goods on your schedule and then guarantee your goods will arrive anywhere coast-to-coast within 7-10 days. In a transition phase? We all know that military orders can change with little notice and your things may have to be in storage longer than you expected. Zippy Shell has a flat rate per container, so you don’t need to worry about incurring extra fees. And there’s more. Will you require more than one stop during your move? Just let them know and they’ll be glad to oblige. Zippy Shell also keeps you updated on the status of your goods and offers personalized help and solutions for your situation. With no deposit, content protection coverage, and the ability to park their street-legal trailers wherever you need them, Zippy Shell might just be the storage or moving solution you’ve been looking for. 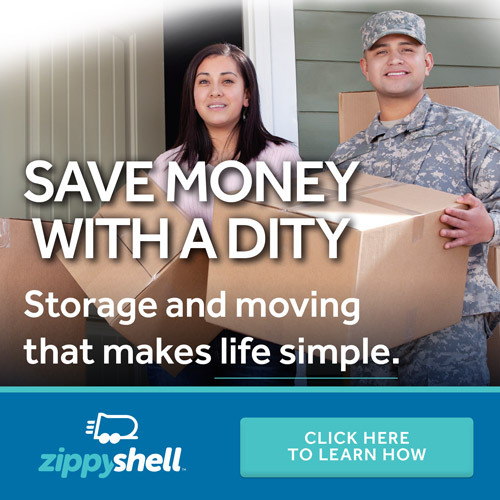 With a motto of “Storage and moving that makes life simple,” Zippy Shell can ease some of the stress of PCS and the transitions of military life. Visit Zippy Shell’s website for more information and to request a free quote. Image and information courtesy of Zippy Shell. Zippy Shell is an affiliate of MilitaryByOwner Advertising.